Bio: Landscape painter Susan Belloni was born in Ottowa, Canada and grew up in Southern California. Susan graduated with a degree in Art from UC Santa Barbara where she first painted the landscape outdoors and witnessed the calamitous oil spill of 1969. She has supported efforts to sustain our natural environment ever since. In 2002, Marcia Burtt, Camille Dellar, Susan and friends started Southern California Artists Painting for the Environment. SCAPE has helped raise over $150,000 and awareness for many local, nonprofit conservation organizations through sales of paintings at SCAPE exhibitions. Through painting Susan shares her love for art, nature & community. After living on Santa Barbara’s Mesa most of her life & as her children grew up, Susan and her husband moved to Solvang in 2013. 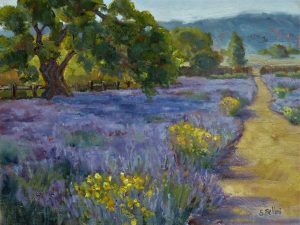 She continues to paint plein air landscapes in Santa Barbara County from the ocean & islands to the valleys & mountains to urban cities & country towns. She paints in oils or acrylics on Italian wooden or Gatorfoam panels, stretched canvas & paper.